Frankie Rose – Gospel/Grace from Slumberland Records on Vimeo. FRANKIE ROSE – Interstellar (slumberland) – New release by indie-rock alumni from Dum Dum Girls and Crystal Stilts. Frankie Rose‘s new kraut/space rock driven album was produced by Fischerspooner collaborator. Coming to Club Dada in Dallas on Friday the 13th of April with Brooklyn’s DIVE. JACUZZI BOYS – Seahawks & Peacocks 12″ (social music record club) – Six song Ep featuring a live session from KEXP and two new studio tracks. SMRC is a subscription service, so it was nice that Jacuzzi Boys had these available on tour. PARENTHETICAL GIRLS – Privilege: Parts II to IV (slender means society) – Parenthetical Girls have released a series of connected four-song 12″s since 2010. Each “Part” is signed and hand-numbered “in the blood of (the) Parenthetical Girl” member individually featured on the 12″. Each LP is released in a limited run of 500. THEE SILVER MT. 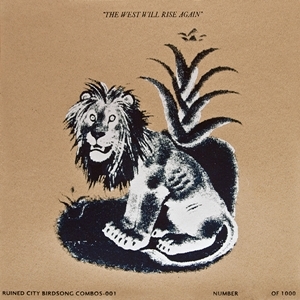 ZION MEMORIAL ORCHESTRA – The West Will Rise Again 2 x 7″ (ruined city birdsong combos) – Hand-numbered out of 1,000, is a new tour-only double 7″ with three songs. Over Twenty-minutes of post-rock madness. Silkscreen sleeve and comes with two printed inserts; one with lyrics. This entry was posted on February 19, 2012 at 8:53 am, filed under News and tagged dive, frankie rose, Jacuzzi Boys, parenthetical girls, thee silver mt. zion memorial orchestra.